Olivia Brown was the first to greet her new sister the night she arrived. It was the beginning of a sisterly bond that has only grown stronger with time. When Bree was 1-year-old, she was adopted by Gary Brown and Lee Clay of Fair Haven. Olivia, who was 14 at the time, remembers the day the family got the phone call that Bree was coming to be a part of their family. “I was so excited, but nervous and anxious,” said Olivia. Gary and Lee knew they wanted to open their home to another child after having their three kids, Olivia, now 25, Riley, 23, and Lloyd, 20. They worked with the state, went through the adoption process, and waited. “Once Bree came to us, she was just immediately a part of our family,” said Lee. No one knew just how much Bree and Olivia would have in common that night the two sisters met at the family’s Fair Haven home, but the two are forever bonded. And that bond is strongly tied to dance. Olivia began dancing when she was in second grade. She was one of the original Kick Dance Studio dancers. 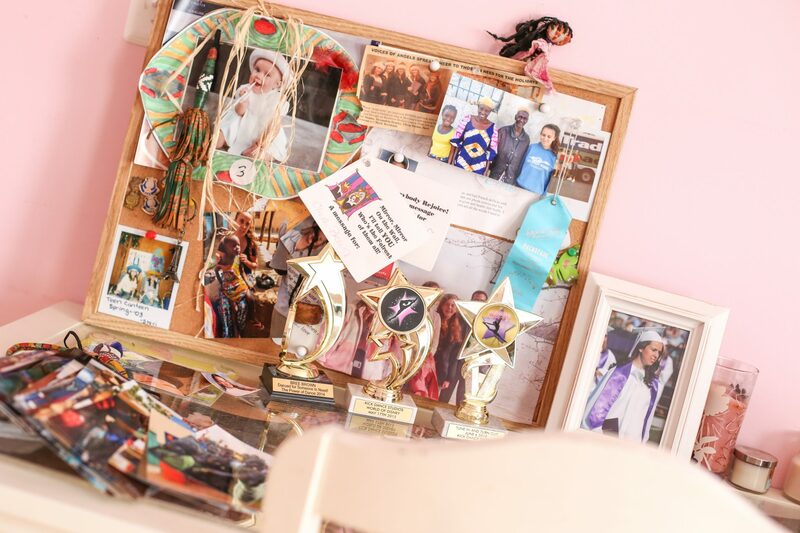 Vanessa Berry, owner and instructor at Kick Dance, was renting studio space, just starting out in her business. Olivia and her friends took a hip hop class every Friday. Those classes turned into competitions as class sizes increased and Kick Dance began to grow into its own. Olivia was an original part of the Kick Dance Studio family. Olivia even worked at Kick Dance for three years in high school, helping the smallest dancers in the classroom and working at the front desk. Bree began dancing at Kick when she was in kindergarten, and is still at the studio today, taking acro and lyrical dance. She’s so into acro that Miss Deidre, the acro instructor at Kick, said Bree has the most flexible back she’s ever seen. That flexibility has helped Bree master her front walk over, and aided her in working to conquer the back handspring. In fact, during Bree’s interview as she proudly talked about her flexibility, she demonstrated her chin stand in her living room floor, a place where she and Olivia have spent countless hours dancing together. That very chin stand was the source of extreme pride for Bree, after Vanessa praised her and encouraged her to keep practicing and to never give up. Once she perfected her chin stand, Vanessa was the most excited. A true testament to the family atmosphere that exists at Kick. After Olivia graduated from the University of Kentucky, she joined the Peace Corps and was stationed in West Africa for 26 months. 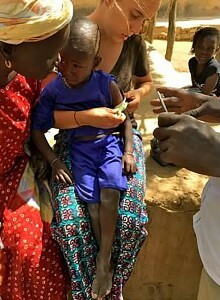 She worked in remote villages as a health development agent, educating the community on hygiene, malaria prevention, nutrition and child and maternal health. Being apart for so long was difficult for the sisters, but frequent phone calls and even a visit to Africa by the family helped ease the distance. When Bree was chosen to perform as Belle in an acro performance, she immediately called Olivia in Africa and gave her the good news. Now that Olivia is back in Fair Haven, the two sisters have been spending time together, often practicing Bree’s dance routines. And what better teacher than a sister who went through the same thing? Bree recently performed in the Kick for a Cause Event, an annual charity show Kick Dance puts on to raise money for a charity they pick each year. Even though Bree has performed in front of an audience before, the 12-year-old still gets a little nervous at times. But this time, without Bree having to say a word, her Kick Dance friend Grace Lehman, who will be featured in an upcoming blog, was by her side. Kick dancers always have each other’s backs. Bree and family are no stranger to charity work like Kick for a Cause. Lee volunteers at Asbury Park’s Covenant House, and the family raises money for the organization. Lee is currently helping to organize A Night of Future Broadway Stars for the organization, an event that is a combination of Broadway stars and outstanding Monmouth County stars, mixing singing and dancing. The event is April 14 at 7 p.m. at Rumson Fair Haven High School. As Olivia passed the proverbial Kick Dance torch to her youngest sister, she physically handed down her Kick Dance sweatshirt to Bree. A symbol of the unbreakable bond shared between the sisters, that grows stronger by the day.